Two documentaries on two of the greatest rock bands in history have been recently released–one focusing on a classic album, the other a searing portrait of a group with a legendary, mythical singer. Stones in Exile comes on the heels of the recent reissue of the Rolling Stones’ classic 1972 opus Exile on Main St. But the documentary is more than just the making of the record per se– it’s about the circumstances that brought about its creation. In this case, Mick, Keith and the boys relocated to France to escape the steep British taxes, something that they were reluctant to do. Add some hangers-ons and drugs, and you got an atmosphere that at first wouldn’t seem conducive to creating music. But somehow amidst the distractions and the new environment, the Stones did, yielding a masterpiece steeped in the American blues. Featuring the reminisces of the current Stones (Jagger, Richards, Charlie Watts) and past ones (Bill Wyman and Mick Taylor) along with those by Anita Pallenberg, saxophonist Bobby Keys and others, the documentary captures a very fertile period in the group’s history as Exile have been since regarded as the last greatest Stones work. The footage and photographs of the period are amazing, and to its credit, the documentary focuses more of the moment, rather than breaking away to talking heads. 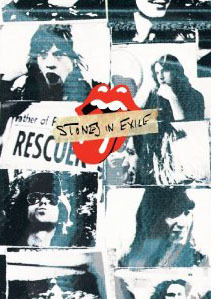 Stones in Exile is a perfect complement to the recent Exile on Main St. reissue. The last time the Doors were given the cinematic treatment was Oliver Stone’s 1991 dramatized biopic, which was memorable thanks to Val Kilmer’s mesmerizing performance as Jim Morrison. 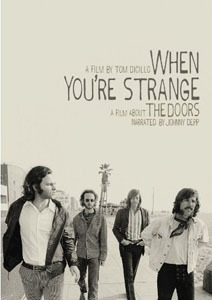 When You’re Strange, directed by Tom DiCillo, is naturally a more accurate depiction of the Los Angeles band, whose dark music was the direct contrast to the peace and love of the ‘60s hippie era. The footage in that documentary is absolutely jaw-dropping–for instance, we see Jim Morrison, in his latter heavy-set phase, driving a car. It looked like it was just shot yesterday as it appeared so pristine–it takes a while to get used to it being actual footage and not a reenactment. The different scenes in the movie blend so easily one after the other and Johnny Depp’s understated narration is equally riveting. The doc also offers an honest portrait of Morrison where the viewer really gets an idea of the depth of his excess and erratic behavior as well as charisma. The Oliver Stone film only tells part of the story; the phenomenal When You’re Strange ably fills in the gaps.